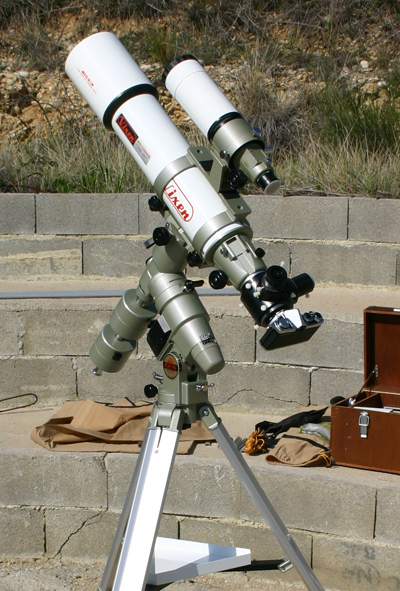 In the summer of 2009 I bought these second hand TEC140, a perfect telecope for astrophotography. The focal length is 980 mm. Untill 2010 I used the telescope with a modidied Canon 40D in a coldbox. Now I using a SBIG ST-8300M. On my first images I found that the stars in the corners were not perfectly round. The chip of a Canon 40D is 22.2 x 14.8 mm, so the sensor diagonal is 26 mm. TEC is recommending a field flattener for diagonals larger than 15 - 20 mm. So a flattner is indispensable when using a DSLR. With the SBIG ST-8300M I first tried it without field flattener, but I discovered that the flattener is also usefull with the 8300 chip, which is 13.52 x 17.96 mm. The diagonaal is 22.5 mm. I'm using FocusLynx to focus automaticly. With a focal reducer / field flattener the focal length becomes 480mm at f/5.6, with an absolutely flat field and pin-point stars. A perfect telescope. In december 2007 I purchased this 10 inch (254mm) Meade LX200R (the tube only). The focal length is 2500mm. I tried a focal reducer, which makes it a f/6.3 system. The f/6.3 focal reducer is not good. Stars in the corners are like comets. Now I 'm using a Astro-Physics 27TVPH telecompressor. Expensive, but it works well. The stars are round. Unfortunatly I cannot use the Moonlire focusser with the 27TVPH. On this picture I cooled the camera with a coldpack. Later I used a coldbox. Now I use a SBIG ST-8300M. 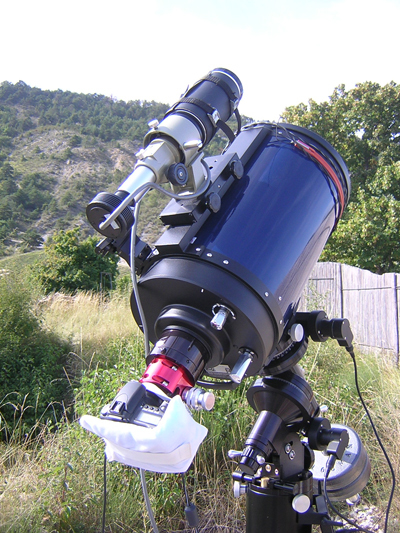 Before I bought the TEC, I used this 4 inch (102mm) apochromatic refractor. The focal length is 660mm, so the focal ratio is f/6.5. In Sky&Telescope of november 1999 the ED102SS was tested. 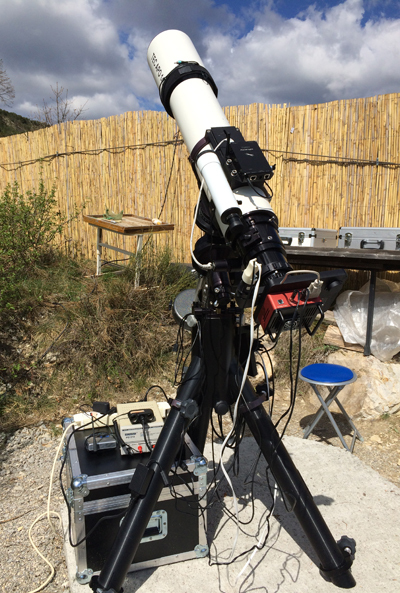 The conclusion was that it is a very good telescope, optimized for deep-sky shooting. "Stars at the corners exhibited just a small degree of distortion due to the astigmatism inherent on most fast refractors." When you look at the high resolution pictures, you can see that the stars in the corners are not perfectly round, but the color correction is very good, as you might expect from an apochromatic telescope. This telescope doesn't have the quality of a TEC, Takahashi or Televue, but it is a good, affordable telescope. On this picture the telescope is shown with my good old Olympus OM1, with which I spend many nights... For guiding I used a Vixen Guiding Scope 70S (D=70mm F=400mm). It's always very easy to find a guide star with this system.